: Return another target creature you control to its owner's hand. The streets of Ghirapur have become dangerous. It's good to have a dependable companion. 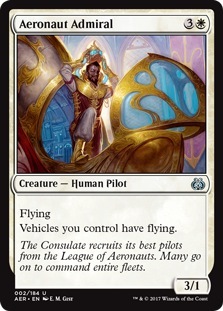 The Consulate recruits its best pilots from the League of Aeronauts. Many go on to command entire fleets. When Aether Chaser enters the battlefield, you get (two energy counters). 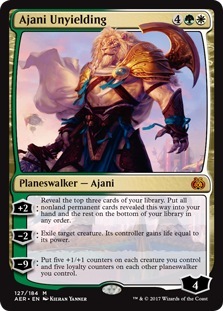 Whenever Aether Chaser attacks, you may pay . If you do, create a 1/1 colorless Servo artifact creature token. 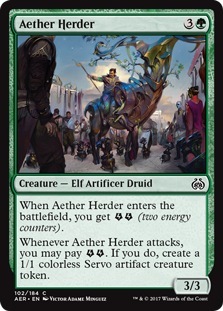 When Aether Herder enters the battlefield, you get (two energy counters). 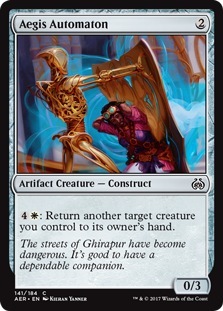 Whenever Aether Herder attacks, you may pay . If you do, create a 1/1 colorless Servo artifact creature token. 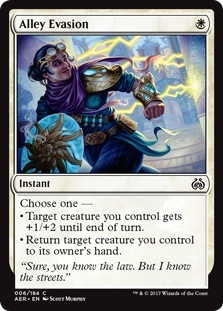 When Aether Poisoner enters the battlefield, you get (two energy counters). 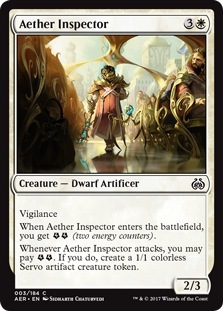 Whenever Aether Poisoner attacks, you may pay . 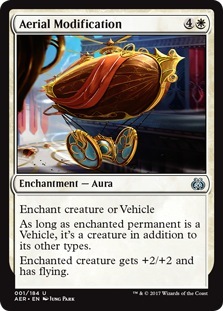 If you do, create a 1/1 colorless Servo artifact creature token. 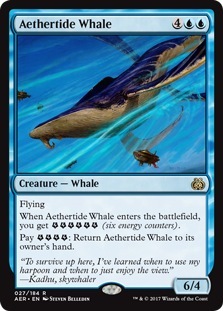 When Aether Swooper enters the battlefield, you get (two energy counters). 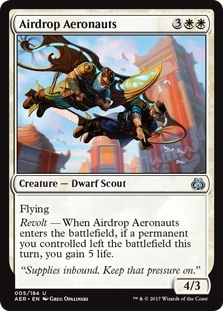 Whenever Aether Swooper attacks, you may pay . If you do, create a 1/1 colorless Servo artifact creature token. Whenever Aethergeode Miner attacks, you get (two energy counters). 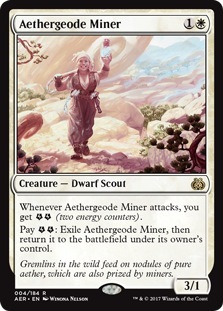 Pay : Exile Aethergeode Miner, then return it to the battlefield under its owner's control. Gremlins in the wild feed on nodules of pure aether, which are also prized by miners. 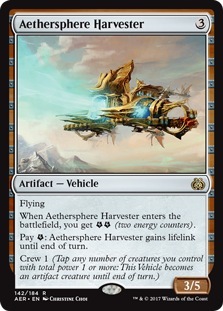 Pay : Aethersphere Harvester gains lifelink until end of turn. 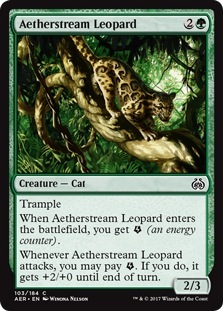 When Aetherstream Leopard enters the battlefield, you get (an energy counter). 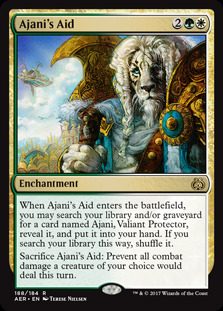 Whenever Aetherstream Leopard attacks, you may pay . 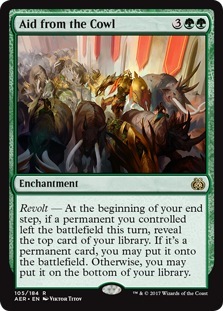 If you do, it gets +2/+0 until end of turn. 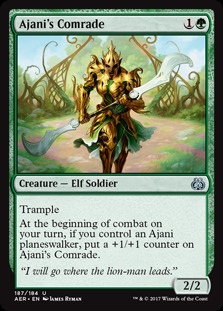 Whenever Aetherwind Basker enters the battlefield or attacks, you get (an energy counter) for each creature you control. 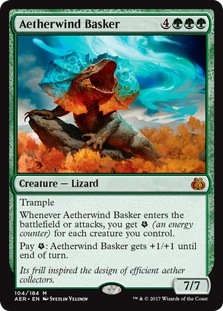 Pay : Aetherwind Basker gets +1/+1 until end of turn. Its frill inspired the design of efficient aether collectors. "Sure, you know the law. But I know the streets."